Good nutrition begins with moderation. Meal planning increases the likelihood of compliance to any diet, particularly a 1200-calorie diet. 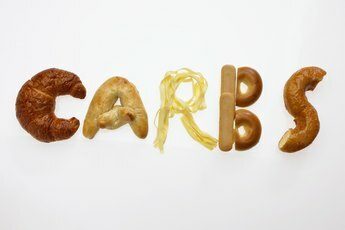 When creating a diet plan, carbohydrates, protein and fat should be incorporated into each meal. Approximately 100 to 150 calories should be allotted for each snack, and the remaining calories should be equally divided among three meals. Since breakfast kick starts the day -- and your metabolism -- make time for it! In relation to your health, the extra ten minutes of sleep is not worth skipping out on breakfast. Make breakfast a priority, and your waistline with thank you. An example of a nutritionally dense breakfast would begin with a high fiber, whole grain, such as one-half cup of oatmeal. This will keep you fuller longer and promote regular bowel movements. Pair the oatmeal with one cup of fat-free cow's milk or light soy milk, which will provide protein, vitamin D and calcium. Throw in 12 raw almonds to add protein and good fats. Finish with one cup of berries, which are packed with antioxidants and essential vitamins. Wash your breakfast down with one cup of hot tea or water to start your day off right! For lunch, think vegetables, vegetables, vegetables! Think bright, colorful foods that will keep your brain and body functioning throughout the afternoon. Good examples include a fresh salad or a sandwich packed with vegetables on whole wheat bread. However, try to steer clear of creamy salad dressings or creamy condiments, as they are typically loaded with calories and bad fats. A healthy, low-calorie salad would start with one cup of raw spinach leaves, which contains folate, vitamin A and vitamin K. Add two ounces of skinless grilled chicken for protein. Add fresh vegetables for flavor and nutrients. Good examples would include the following: one-half cup of shredded carrots, one cup of multi-colored peppers, one-fourth cup of black beans, one-fourth cup of corn and one-half cup of tomatoes. Top the salad off with one tablespoon of raw sunflower seeds for good fats and two tablespoons of low-calorie salad dressing. Wash it down with unsweetened tea or water to reduce calories. 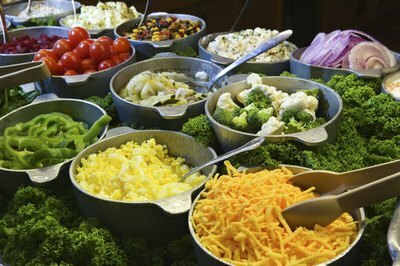 When planning dinner, try to comprise your plate of one-half vegetables, one-fourth starch and one-fourth lean protein. This will provide maximum nutrition, while maintaining portion control. 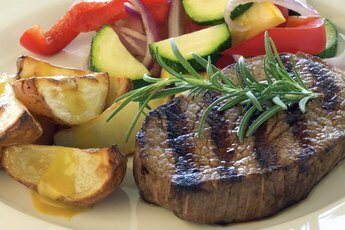 An example of a 350-calorie dinner would begin with a lean proteins, such as three ounces of pork tenderloin. Add one half cup of green beans and one-half cup of steamed carrots to help fill your stomach with low-calorie, nutrient-dense vegetables. Finish with one small baked potato, and remember that the nutrients of a potato are found right underneath the skin. Wash it down with unsweetened tea or water. When determining snacks, fresh fruit is always a good option. One small to medium-size fruit is typically 100 calories or less. Examples include one of the following: one medium apple, one medium orange, one small banana or one medium grapefruit. 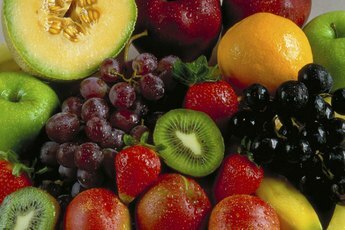 All of the mentioned fruits contain essential vitamins and minerals to help fight and prevent disease. Reserve your second snack for any cravings that may present themselves throughout the day. The smart way to defeat those persistent cravings is with portion control. 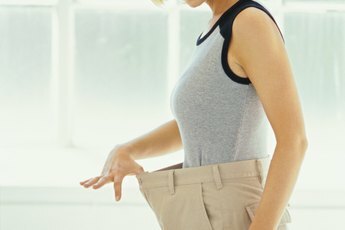 Whether your craving is sugar, salt or fat, use self-control by consuming small portions, such as one fun size packet of peanut M&M's, one cheese stick, three cups of air-popped popcorn, four ounces of red wine or one skinny latte.